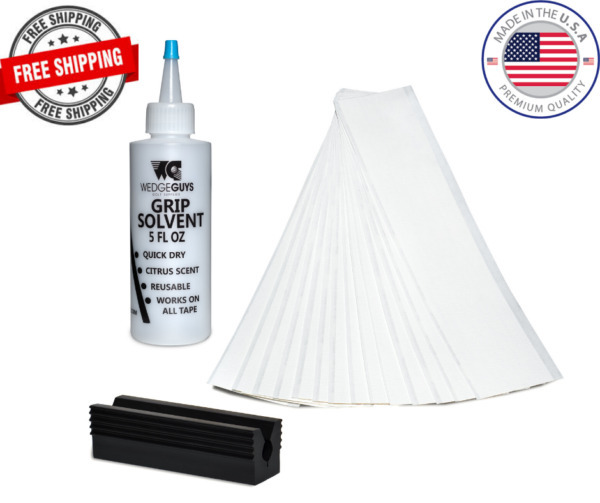 eBay Wedge Guys Golf SuppliesProudly Made In The USA!#1 Recommended Kit of PGA Professionals!Complete Grip Kit Product List:15 - Professional Quality Pro-Grip Double Coated Tape Strips - Exact Cut 2" x 10"1 - 4oz Bottle of Professional Grip Tape Solvent / Activator (Wedge Guys now uses a "Coned Squeeze Top" on our solvent. We have found that these tops are far superior and easier to use than the spray tops used by much of our competition)1 - Long Life Full Size 3.5" Rubber Vise ClampDon't Fall victim to false claims and poor quality products, at Wedge Guys we pride ourselves on our quality and customer service!We have all you need right here for your golf club grip overhaul! This kit contains all the materials needed to install your golf grips just like professionals have been doing for years. Wedge Guys uses professional grade double coated tape, non-toxing solvents and long lasting rubber compound vise clamps that yield exceptional quality at a price that can't be beat!Shipping, Handling, Payments-Shipping is always Free in the US !-Shipped USPS First Class (2-4 Business Days)-Same Day - 24 Handling Time on Orders - Shipped Monday-Saturday-All Order Processed Through eBay payments and Shipped to the address provided at check outTop Rated Plus Seller so you can BUY WITH CONFIDENCE!Use with all grip types including:Golf PrideLamkinWinnSuperstrokeIomicplus more!! !